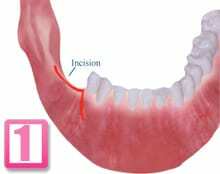 A incision is made through the gum at the back of the lower jaw. 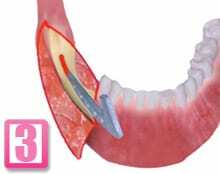 The Blade Implant is placed into the gap in the jaw bone and secured in place. 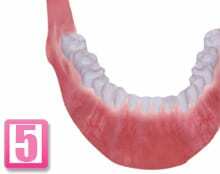 A Bridge is designed (a number of porcelain Crowns joined together) and secured over the Blade Implant Head. Small holes are drilled through the jaw bone. 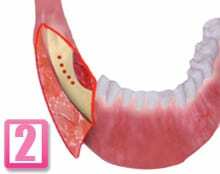 Gradually these holes are joined up to form a thin gap which Blade Implant is to be placed into. The gum is sutured (stitched) back in place, leaving the Head of the Blade Implant protruding through the gum. 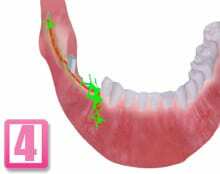 A 2-3 month healing period is required before placing the Crowns (or Bridges) over the Implant Head.